Pinch Hitter is a gaming app that transforms you into a pinch hitter, working on your batting skills. It was developed by Mousebreaker Ltd., costs $0.99, and can be used on an iPhone, iPod Touch, and iPad. The first step in setting up a game is choosing a MLB team to play for. You get all teams from the American and National Leagues to choose from so of course the Dodgers are the obvious choice. The game is split into two sections: Challenge and Home Run Derby. While Challenge is focused on levels, Home Run Derby is a practice. You play by using two different buttons on each side of the lower half of the screen. On the left is a box within a box that you use to control where you are swinging your bat and on the right is the Swing button that controls when you hit the ball. There is a Bat Swing Marker that glows green when you are lined up correctly over the plate. If the bat is lined up correctly then the ball lights up at the time you need to use your Swing button to hit it. Pinch Hitter gives you the option to Play via Facebook if you are trying to impress your friends with your hitting skills and how much free time you have (jealous!). I have to admit that this game is highly amusing. It is simplistic and offers a lot in the way of levels, which keeps things interesting. 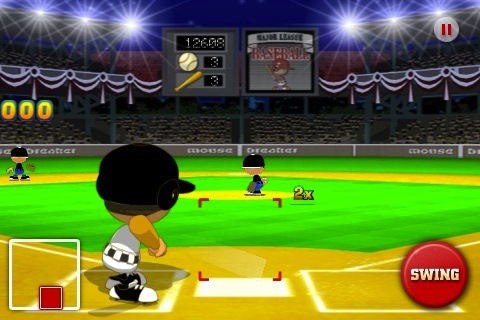 AppSafari review of Pinch Hitter was written by Vanessa Paszterko on November 23rd, 2010 and categorized under App Store, Fun, Games, Sports. Page viewed 4448 times, 1 so far today. Need help on using these apps? Please read the Help Page.